AnTherm is fully validated according to EN ISO 10211:2007: AnTherm has been qualified as a "Class A" tool – as for two- and three-dimensional, stationary precision method. This validation is mandatory in the framework of the EPBD-regulations of the most EU Member States. European standards "Thermal Bridges in building construction Heat flows and surface temperatures - Part 1: General calculation methods" (EN ISO 10211-1) pertaining to aspects of thermal performance of building constructions are already available since 1996. The EN ISO 10211:2007 "Thermal bridges in building construction — Heat flows and surface temperatures — Detailed calculations" shows further development of the standardization. The standard EN ISO 6946 "Building Components or Building Elements - Calculation of Thermal Transmittance" is also available. The EN ISO 10077-2:2003 "Thermal performance of windows, doors and shutters - Calculation of thermal transmittance - Part 2: Numerical method for frames" shall be also considered. The ramifications of the adoption of these European Standards became apparent: they describe the substance of essential tasks for designers, manufacturers, and builders, as well as their significance for quality control in the field of energy conservation. For more detailed description of of the concepts relevant to evaluating thermal bridges, see "Primary Concepts". determination of linear and point thermal transmittance and surface temperature coefficients (of thermal bridges). Furthermore, "high precision" methods of calculation are demanded, whereby precision criteria which must be satisfied by the method chosen are defined in the standard. 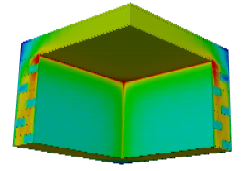 According to EN ISO 6946 "Building Components or Building Elements - Calculation of Thermal Transmittance", calculation of heat transfer coefficients of parallel plane surface building components shall be performed based, of course, on one-dimensional models. For such components, composed of surface parallel layers of thermally homogeneous or non-homogeneous materials, a well-known method of estimation (ISO-method) can be implemented in order to obtain a design thermal resistance - assuming the maximum relative error remains "negligible". Zasadnicze elementy konceptu teoretycznego zostaly przejete do „normy mostków cieplnych“ EN ISO 10211, tak wiec absolutna zgodnosc z norma jest osiagana przez program AnTherm bez najmniejszej trudnosci! Program jest równiez walidowany z 10 przykladami Normy ISO 10077:2003 zalacznik D.
ISO 7345 "Izolacja cieplna - Wielkosci fizyczne i definicje"
ISO 10456 "Materialy i wyroby budowlane-Wlasciwosci - wlasnosci cieplne i wilgotnosci. Tabele wartosci i procedur projektowych dla okreslania termoizolacji zadeklarowanych wartosci obliczeniowych"
ISO 13370 "Metody obliczania wspólczynników przenoszenia ciepla i wielkosci strumieni ciepla przez elementy budowlane w kontakcie cieplnym"
ISO 13786 "Cieplne wlasciwosci uzytkowe komponentów budowlanych – Dynamiczne charakterystyki cieplne -- Metody obliczania"
ISO 13788 "Cieplno - wilgotnosciowe wlasciwosci komponentów budowlanych i elementow budynku. Temperatura powierzchni"
ISO 13789 "Wspólczynnik strat ciepla przez przenikanie HT oblicza"
ISO 14683 "Mostki cieplne w budynkach-Liniowy wspólczynnik przenikania ciepla – strumien ciepla w stanie ustalonym podzielony"
Or try and evaluate the demonstrational version just now!